I did post this activity last year but unfortunately it was just the day before Earth Day so you probably didn't have time to make it with the kids. This year, I'm a little more prepared and posting this earlier. Here is the link to last year's post which also has other Earth Day ideas to use with kids so that you can plan some fun activities! 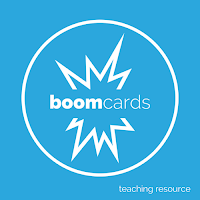 Boom Learning is a fairly new site which provides digital learning with fun, paperless, digital task cards. Boom Cards are NO PREP and they can be played on interactive whiteboards, computers and tablets. An internet connection is required. The cards can be played over and over again and are Self-Checking! This is because the cards indicate whether the answers are correct or not. Read the following paragraph from BOOM Learning to learn more about BOOM Learning. I have a FREE deck of BOOM cards for you to try in my TPT Store. Click on the top picture to go to my TpT store. There you will learn more about the deck and get your link to download the free deck! If you prefer, here is a link that will take you directly to my BOOM Learning Store. This link will take you directly to my Fractions Digital Task Cards. Also if you would like a FREE worksheet for your students to use with the free digital cards, then click on the picture below to go to my website where you can download the free FRACTIONS WORKSHEET.